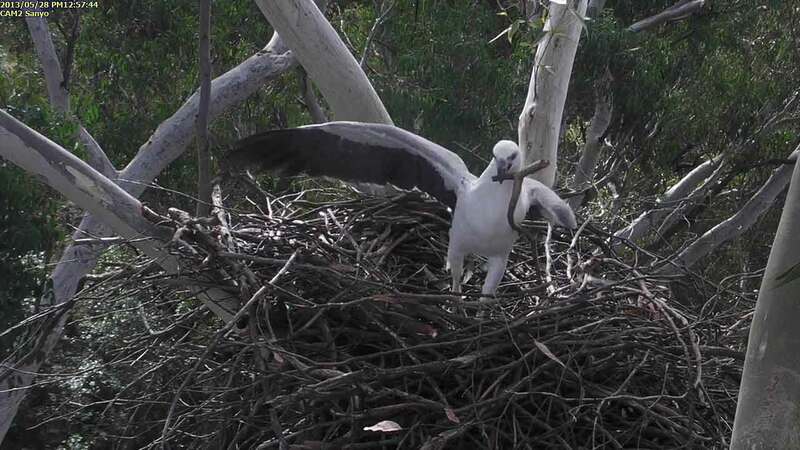 There has been a White-bellied Sea-Eagle nest in the woodland for many years with a succession of eagle pairs renovating the nest in the breeding season. Historic observations go back to at least 1967. 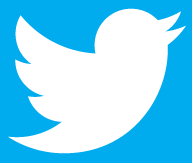 For information about what has happened so far look at our News page. 2013: In the early months of 2013 the eagles visited the 2012 nest three or four times a week, mostly short visits and maybe move a few sticks or two. Then on the 13th April 2013 the first stick was delivered by the Male. From then on they would attend the nest every other day. The cameras were removed on the 26th April 2013 for maintenance and upgrade. The cameras were reinstalled on the 6 May 2013. The Sanyo camera from 2011 / 2012 was installed in the nest tree about 5 metres from the nest and slightly above. 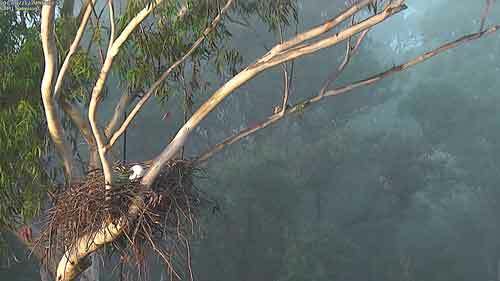 This camera was south of the nest looking north. The Samsung PTZ camera was installed in the same tree as 2012 which was 20 meters north of the nest and about the same height as the nest looking south/south east. 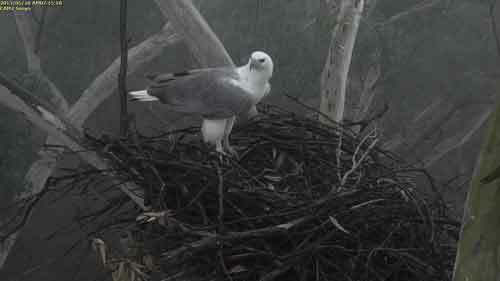 First egg laid: 6 July 2013 at 5:13pm. 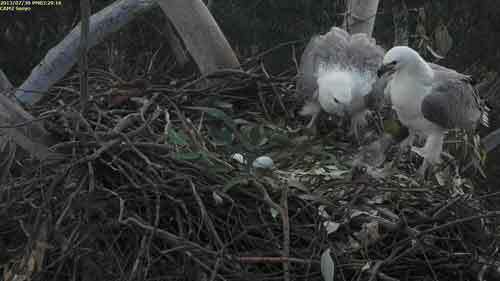 Second egg laid: 9 July 2013 at 5:51pm. Day 40 for egg 1 passed on the 15 August, and day 40 for egg 2 passed on 18 August. They were both over the expected hatch time. 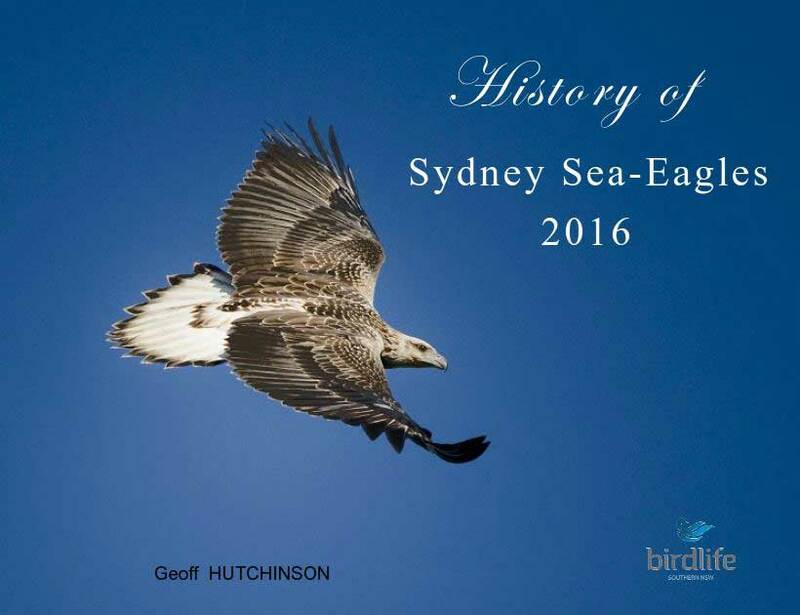 Observations were continued and on the 2 September the eggs were recovered from the nest for testing. See Eggs Test Report.